Janine Lesiak of United Kingdom, leaves in Leeds. Janine is a Physical Education teacher and has been involved with Tchoukball for 12 years. Aside playing Tchoukball she is also playing Net Ball. 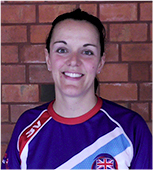 She is now the performance director at Tchoukball UK, she is responsible for all the coach trainings in UK, with about 1000 level one coaches. In this interview, Janine explains to us what are her task as the Performance director of Tchoukball UK, what are the major obstacles to develop the game in UK, and their plans put in place to overcome those difficulties.